Doing your own sewing repairs can save you some money and you’ll always be able to leave the house looking neat and tidy. You don’t need to be a seamstress or tailor or need a bunch of expensive equipment. This list outlines basic essentials. If you have some talent or training in sewing you may want to invest in more tools, but these are the minimal items necessary for most DIY repairs. 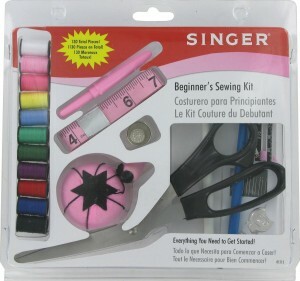 If you prefer, you can buy a sewing kit that contains all of the basics. I would rather build my own kit, as I prefer left-handed scissors and I like to select my own colours of thread. Invest in quality scissors to be used only for sewing. I recommend two pairs: Dressmakers shears with 8″ (200mm) blades for cutting fabric and embroidery scissors that have blades about 3″ or 4″ (90mm) long for precision cutting and trimming. If you’re left-handed, buy left-handed shears. It will make sewing tasks much easier. Using sewing scissors for paper and plastic will quickly dull the blades making it difficult to cut fabric. Use a marker or label to indicate that these scissors are to be used for sewing only. Purchase a variety of needles in a one-at-a-time dispensing pack. You’ll have the needles you need and they’ll be organised too! Pins should be straight and sharp with colourful heads that do not melt if you iron over them. Store the pins in a small plastic box or in a pincushion. Magnetised pin holders are handy for picking pins up from the floor but they do not protect your fingers from getting stabbed. Safety pins, in a variety of sizes can be used for pinning things together that you may not have time to sew. They can also be used to help feed elastic or cord through waistbands and cuffs. 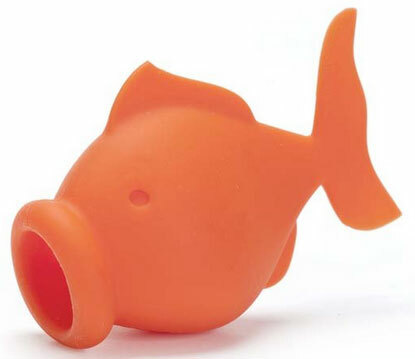 You can hook them together into a long strand to keep them organized if you don’t have a storage container. Purchase quality poly-cotton blend thread in a variety of colours that match the majority of your clothing. You should also buy an olive drab colour because it can be used on almost any dark material (blues, blacks, browns). There is a reason the army calls this colour “camouflage!” Good quality thread should have a smooth finish; fuzzy thread will tend to get caught while sewing and break easily if pulled too hard. This is a tool with a sharp point, a blunt point and a sharp blade in the middle. If you stitch something in the wrong place, use a seam ripper to cut the stitches without cutting the fabric. It can also be used to remove buttons that are half hanging off and for cutting thread in areas that scissors won’t reach. You should have a flexible measuring tape at least 150cm (60″) long with imperial measurements on one side and metric on the other. Fabric tape measures stretch slightly with heavy use so if yours is older, you may wish to replace it so that you have accurate measurements. Ironing removes the wrinkles and seams and presses folds neat and sharp making fabrics easier to sew. If you don’t have the space to store a full-sized ironing board, invest in an ironing pad. Also use a pressing cloth when ironing delicate items that might be damaged or those that have a special surface such as sequins or glitter. There is no need to purchase a special store bought pressing cloth, a lightweight cotton or linen dishtowel will do as long as it is clean, stain-free, and white as colours and stains may transfer to your fabric. Fusible hem tape is used with an iron to quickly hem skirts and pants. It is ideal if you don’t have matching thread available or if you’re in a hurry. Be careful when you iron as you might scorch delicate fabrics. It may lose its adhesiveness after multiple washings so stitching can reinforce it. Keep a variety of buttons handy in assorted colours and sizes to match the majority of your clothing. Keep them in a small, divided, plastic container with a tight fitting lid. Often the clothes you purchase will come with little packet of extra buttons so this little container is a great place to store those extra buttons. It never fails that in the rush to school and work in the morning, someone has a nylon backpack strap or shoelace that is unravelling. A quick flick of the lighter will melt the ends of synthetic straps so they won’t unravel. And if someone misplaces the lighter used for the birthday candles, you’ve always got a spare one in your sewing kit. Sewing tools need to be cared for just like any other tools. Keep them free from dirt and do not drop them. Store your sewing tools in a plastic bin or decorative basket. It can be plain or fancy, with or without handles. It should however, have a sturdy latch. This $17 unitasker even has an infomercial, but sadly it lacks the person who doesn’t know how to do the task without the device (which is by far the best part of any good infomercial). I always do a check before choosing a unitasker to make sure we haven’t featured it or something very much like it before, and I was a little surprised to see how many egg unitaskers we have written about over the years. Apparently, the simple egg is inspiration for a ridiculous number of them: the Vacu Vin Egg Pillow, the Egg Minder Internet Connected Egg Tray, the plastic Egg and Spoon Race Game, Piercy the Egg Piercer, the Rollie Eggmaster, the Egg Cuber, Eggies, then there are at least five more egg unitaskers I’m not listing because this list is getting insanely long, and finally the one with the best infomercial ever, the EZ Cracker. Feeling low on motivation? Here are four ways to get it back. Ideas on storing pieces to component-heavy roll playing games. There are hundreds of ways to sabotage your uncluttering and organizing efforts, and just one solution for all of them — admit to yourself that you’re sabotaging your success. There are a number of reasons why you might want to think twice before buying Apple’s new iPad. Last year, I was inspired by David Seah’s post “Ground Hog Day Resolutions.” In the post, he introduces a set of goals that he revisits monthly with standardized check-ins. Each goal is meant to provide a tangible means of fostering success throughout the year. I came across this practice on Valentine’s Day, so my list of Valentine’s Day resolutions (VDR) was born. Create a reason for people to visit my site. Build excellence (practice makes perfect). There are no goals set for January, as the beginning of the new year is set aside for reflection and relaxation. My main professional goal for 2014 is to improve my writing skills. This February, I will write one post per day on my personal site. This satisfies all of my criteria: it increases visibility, builds a product inventory, creates a reason for people to visit the site, reinforces a productive new habit, and fosters excellence. I encourage you to play along. You needn’t adopt professional goals, of course. Anything will work. Define the criteria that will represent success for yourself and set up monthly review periods (that’s the crucial bit). And, by December, I should have accomplished nine awesome monthly goals. Clutterfree with Kids by Joshua Becker is not a book of organizing tips. It does not tell you what type of baskets to buy. It does not tell you how to arrange clothes in your closets. This book helps you evaluate the choices you make and develop new habits to lead a life that is full of meaning and free of clutter. Mr. Becker describes the empty promises of advertisements and their attempt to convince us that the more we own the happier we will be. He recounts the journey he and his typical American family have taken towards living a minimalist lifestyle and the challenges they faced. In the first section, “Change Your Thinking”, Mr. Becker presents an alternate way of thinking about uncluttering and organizing. He explains the impact minimalism can have on contentment, generosity, and honesty in one’s life and also debunks many of the myths of living a minimalist lifestyle. It really is not stark and boring! The section of the book that focuses on parenting states, “the lifestyle of minimalism requires far more inspiration than instruction.” It describes how parents can best model the minimalistic lifestyle. It also outlines the benefits of family life where possessions are deemed less important than self-development and interpersonal relationships. Mr. Becker outlines a roadmap to becoming clutter free and explains how to include your children on this journey. He does not stick to hard and fast rules but asks questions that allow the reader to choose the minimalistic path that is right for his/her family. Clutterfree with Kids will show readers new ways of thinking about, and establishing better habits, regarding children’s toys, clothes, artwork, and collections. There is advice on how to adjust schedules to spend more time participating in developmental activities and reducing the amount of ‘screen time’ – be it computer or television. 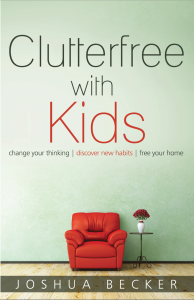 Clutterfree with Kids is an enjoyable, refreshing, easy-to-read book. Mr. Becker provides practical advice in a non-judgemental way. He encourages readers to adopt a level of minimalism with which they are comfortable. Whether you are new to minimalism or you are new to parenting, this book can help you move toward a happier and more minimalist life. This is one of those unitaskers that at one point had a convenience value, but doesn’t really have that any longer. Say, “hello,” to a relic of the distant past, the Hot Air Popcorn Popper. At least for those of us in the northern hemisphere, January is a great time to make summer travel plans. You are able to beat the rush and still get some good deals on popular travel destinations, as well as you are able to think about things other than the cold and wind and snow currently going on outside. Sure, knives are incredibly functional and built to handle all your chopping, slicing, and dicing needs — but why use an incredibly simple knife with products like the over-engineered Avocado Cuber on the market? Directions for how to get your home pantry to work for you, not against you. It is rare that someone submits a unitasker and my first thought is, “I want that!” But this week, that was my response. Even I, the UNCLUTTERER, am tempted by plastic doodads that do the exact same thing as the knives I already own. Lately, Unclutterer writer Jacki Hollywood Brown and I have been sending each other links to humorous articles about people who come up as the INTJ type on the Meyers-Briggs personality test. Both Jacki and I are this rare result (fewer than 3 percent of females), and although we don’t put a huge amount of stake in these test results, we both nod our heads and smile when we read articles describing traits that are common to our INTJ type. Know yourself. Organized people typically know themselves very well. They know how they access information and goods and create storage systems that reflect these preferences. They know how many steps is too many for them to maintain order. They know how they prefer to work and live. They know what they need, and what they don’t need. They know their responsibilities. Most importantly, they know what they want in life and what their priorities are. Being organized is not the goal. People who are organized are not organized for the sake of being organized. They are organized so they can enjoy the benefits of being organized. An organized life is their way of getting rid of distractions so they can focus on what matters most to them. Expect to fail. No one is organized in every aspect of their life every day of their life. People fall off the organized wagon. The difference between organized and disorganized people, however, is that organized people accept this as part of the process and simply start again. We’re human; we don’t have super powers. A place for everything, and everything in its place. People who are organized have a place to store every single item they have in their home. If something doesn’t have a storage place, it will always be out of place and in the way. Each shirt needs a hanger or a space in a drawer. If there isn’t enough room to store all of your shirts, there will always be dirty laundry or clean laundry hanging out in a hamper. If shoes don’t have a place to live, they will wind up in the middle of the living room floor or in a heap by the door. Write it down. This could also be stated as “capture it” or “type it in.” The point is that organized people get their to-do items out of their heads and onto a list or calendar so they don’t worry about dropping the ball. No need to remember you have a dentist appointment on Thursday when you can just look at your calendar and see that it’s scheduled on Thursday. Your mental resources are free to think about important problems/happy thoughts/complex issues instead of when, six months from now, you should be at your dentist’s office. Routines are the backbone of organization. Organized people have routines worked into their days to take care of the boring, repetitive, and/or undesirable tasks. At the end of a work day, the desk is cleared, tomorrow’s calendar and to-do lists are reviewed, and the desk is set so it is ready to go the next morning so work can begin immediately. After school, the kids pull out their lunch boxes and put them on the kitchen counter and then have a snack high in protein before settling in to do their homework. At bedtime, the kids take a bath, put on their pajamas, have no more than three books read to them (which have been chosen prior to the bath), and then it is lights out at the same time every night. Actions are dependable and familiar and provide stability. Follow through and don’t delay. Organized people don’t see dinner as being finished when the last bite of food is swallowed. Organized people see dinner as being finished when the table is cleared and wiped down, the floor has been swept, all dirty dishes have been loaded into the dishwasher, and the dishwasher is started. Wrapping a present isn’t finished when the bow is placed on the package but only after all supplies — tape, wrapping paper — have been properly stored. If anything can be done in less than two minutes, it will be done straight away instead of putting it on a to-do list. Do your part. Organized people tend to see that they are part of a unit or team instead of a lone wolf. This means, if they share a house with someone, they know they have responsibilities about cleaning, caring, and maintaining the home simply because they live there. They try not to make work for other people and do what has been assigned to them. Or, if they are in charge of assigning work, they know that everyone involved has a stake in the project/home/team/etc. and thus make sure everyone has responsibilities reflecting their abilities to contribute. Don’t own a lot of superfluous stuff. When organized people cease having a need for something, they typically get rid of it. They only keep what they value or use. Trust in the future. Most organized people trust that in the future they will be able to either buy, borrow, or acquire the tools they will need when they need them. Saving an unnecessary object just in case isn’t really an organized person’s style. That being said, an organized person does tend to have things that are useful and necessary on hand when they are needed. For example, toilet paper rarely runs out in an organized person’s home because systems are in place for storing and replacing toilet paper as demand requires. An organized person will likely have one shelf in a linen closet designated for toilet paper storage and when supply depletes beyond a certain point, toilet paper will be added to the shopping list. Conversely, an organized person doesn’t buy more toilet paper than can fit on the toilet paper storing shelf just because there is a deal. Other deals will come and an organized person trusts that he will take advantage of those other deals when he needs more toilet paper. You are not your things and your things don’t contain souls. Organized people aren’t heartless creatures who never feel anything sentimental toward a physical object. In fact, they might be sentimental fools. This being said, they are rational enough to know that grandpa is not IN the painting he left them after he died. They know that the baby blanket they saved for their child is not their child. If they get rid of the object or if the object is destroyed in a fire, their memories still exist and they still love grandpa and their child. It’s better to have a tree than a forest. Sometimes I phrase this as “quality over quantity.” Either way, organized people tend to keep the best object (best, obviously, being subjective to the keeper) instead of all the objects. Instead of keeping a five inch stack of their child’s artwork from kindergarten, they keep their favorite piece and hang it on the wall or store it in an archival quality way. Instead of printing every photograph from a favorite vacation and hanging all 427 images on the wall, they frame their one favorite image or use it as their screensaver on their computer. Being organized isn’t for everyone, it’s a choice only you can make for yourself. Simply stated, you can’t force someone to be organized. Not everyone has a desire to be organized. There are multiple paths to a happy, fulfilled life, and being organized is just one path to that goal. You can certainly teach others about how to be organized and you can let them see the benefits you garner from being organized, but you can’t force someone into being organized. And, harboring resentment toward others for not being organized only clutters up your time. Accept their decision, no matter how much it frustrates you. Maybe one day they will come around to your way of seeing things and they will be more likely to ask for your help if they’re not mad at you for being a jerk to them when they weren’t. Anyone can be organized. Being organized is a skill set, it is not a natural ability — it’s nurture, not nature. It certainly comes more easily to some people, but that doesn’t mean an organized life is impossible to achieve if it comes slowly to someone else. Being organized takes practice, same as a sport. Every day at Unclutterer, we share tips, tricks, thoughts, and strategies for a clutter-free lifestyle. As 2014 begins, I want to step back and see the proverbial forest instead of the trees. Just what are the benefits of being organized? It’s potentially a long list, but I’ve narrowed it down to what has affected me the most. Read on for what I consider the benefits of an organized life, at home and at work. Spend time with my family. Getting clean and clear professionally and personally means I’ve got more time to spend with the kids and my wife. For example, my workday ends at 2:00, just as I drive to the school bus. I know that I’ll be spending the next six hours with my family. That’s easy to do when I took care of all my work stuff before then. I’m ready for a curveball. I’m sure you know how this goes: life throws a kink into the works that interrupts your plans in a major way. Being prepared ahead of time lessens the impact. For example, I have a designated “emergency” office and ultra-portable setup ready. That way, if my Internet connection goes down at home, or a construction crew sets up outside my window, I already know where I’m going to go to work and what I need to bring. The overwhelming seems manageable. I never would have believed this if I hadn’t experienced it myself. I don’t care if you’re talking about work, the kids, or home management, but it’s a great feeling to have every project defined, and every action step that stands between you and “done” clearly identified. When I do this, I can look at a daunting to-do list and feel like I’m on top of it and capable of doing what needs to be done. Improved health. The stress I mentioned earlier, which I feel when things start to get out of control, does not promote good health. There are numerous studies that demonstrate a link between sustained high levels of stress and a variety of health problems. I’m a better example for my kids. There was a time when I spent most of my time behind my computer, working on this or that. I felt productive, sure, but I also worried about the message I was sending to the kids. Adults work all the time? My job is more important than them? I want my kids to become productive, contributing adults, of course, but I want them to enjoy life, too, and that absolutely includes time spent not working. Fewer little jobs. There are four people in my house. If we miss a day or two of laundry, we’re behind. That means that, some day this week, someone has to spend an inordinate amount of time digging out from Mt. Clothing in the basement. However, just turning over a single load per day makes all the difference. Little things like making sure the kids put their hats and boots away each day after school improves our family’s ability to easily function. Greater productivity. When you know where things are, what your goals are, and take care of the piddley busy work as it appears, you’ve got significantly more time and energy for the big goals in life. An organized life takes some doing, and you’re going to slip up. No one is clean and clear all day, every day! But when you strive to do the best you can, you’ll experience the benefits listed above … and more. Here’s to an organized and rewarding 2014, unclutterers! May you experience the best of an organized life. Junk drawers can be the one of the most useful storage areas in your home. Here are five steps to help you get it organized. Reader Lirpa wants to know how she can part with an item she used and loved for a long time, and is now grieving over it being broken. Organizing a home renovation is no easy task. Coordinating with contractors, applying for building permits, and keeping track of all of the bills, invoices, and receipts can be quite time consuming. The following seven tips are things to consider prior to starting a renovation project so it runs more smoothly. Unclutter. Keep only items used on a daily basis in the space you are renovating. For example, during a summer time kitchen renovation, pack away Christmas dishes and place them in storage. If the renovation is scheduled for your bedroom, place off-season and seldom worn clothing in another area of the house. Security. There will be times when your home will not be secure, such as when workers are transporting materials in and out or if windows are being replaced. Consider placing valuable jewelry and vital documents (birth certificates, social security cards, etc.) in a safety deposit box for the duration of the renovation. Other sensitive documents, such as receipts and bank statements should be stored in a locked filing cabinet. Sentimental items such as photos, souvenirs, and memorabilia should also be packed away so they will not be damaged. Safety. Remember that a renovation is a construction site. There may be electrical wires exposed and places where you can slip, trip, or fall. Discuss the risks with the contractor and consider installing barrier gates to keep children and pets out of the area. Small pets such as guinea pigs and rabbits can get into holes and get sealed in. Cats may get curious and get stuck in places they shouldn’t. Dogs may get slivers in their paws from walking through broken bits of wood. Consider having your four-legged friends stay with family, friends, or pet daycare if you cannot be home to supervise them during the renovation process. Review routines. Before the renovations begin, examine all of the ways the project will interrupt your regular routines. For example, if you have to shower in the guest bathroom in the mornings, will you be able to walk through the house in your bathrobe? You may need to plan extra time the night before to bring your clothes to the guest bathroom. If you will be using another entryway for access into the house, you may need to move the car keys, cell phone charger, and children’s backpacks. Ensure you have a place for incoming mail so that bills still get paid and important documents get filed. If you can’t get to your filing cabinet, invest in a small accordion-filing folder to use during the renovation process. Create swing space. If furniture must be removed from certain rooms during the renovation process, it should be placed in a way that doesn’t interfere with household operations. You just can’t cook a decent meal with a sectional sofa in the middle of the kitchen. You may wish to clear your garage or basement or consider putting some furniture temporarily into storage during the renovation. Plan for the unplanned. You should have a back up plan in case of emergencies, such as a busted water pipe or heating/air-conditioning system shutdown. Have a list of local hotels handy in case you need to make a last-minute reservation. It is also helpful to have a list of local restaurants that offer take-out and delivery for breakfast, lunch, and dinner. Keep a stash of coins and a large mesh bag in your car in case you need to use the local Laundromat. Think positive. As my mother is fond of saying, “This too shall pass.” Renovations are a temporary state. Once completed, you’ll be able to enjoy your new space, and look back and smile at your renovation adventure.